The avocado is a fruit abundant in antioxidants, minerals, phytonutrients, dietary fiber and monounsaturated fat. The health benefits of avocado are well-researched and widely known. According to Avocado.org, the California Avocado Commission's website, the healthy monounsaturated fat in avocados can help to reduce cholesterol levels when eaten instead of saturated fat. The mild flavor and creamy texture of avocado makes it delicious to eat plain as well as to complement other ingredients in mixed foods. Avocado is best eaten when the flesh is moderately soft. Guacamole, a mixture of pulverized avocado which often contains additional seasoning and other ingredients, is a favorite snack of Americans. FoodReference.com reports that 50 million lbs. of avocado are consumed in the U.S. on Super Bowl Sunday alone. 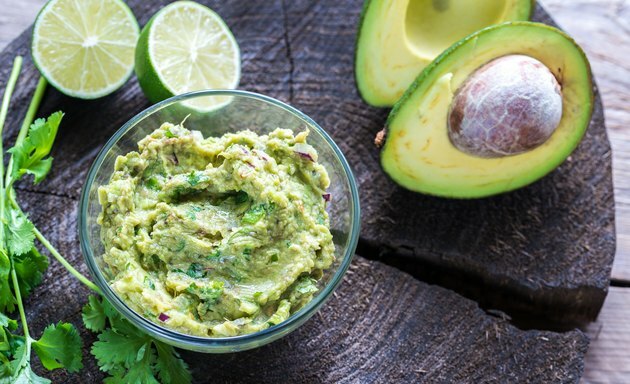 While many varieties of commercially prepared guacamole are sold, the dish is often tastier and likely healthiest when prepared from scratch. Doing so is relatively simple; the foundation of guacamole is ripe avocado, mashed to a creamy consistency. Added seasonings often include one or more of the following: salt, pepper, lemon juice, lime juice, cilantro, chilies and chopped tomato. The fat content and creamy texture of avocado complements many sandwiches. These qualities also make avocado a healthy substitute for other fats like mayonnaise, oil, butter and margarine. For example, make a simple and delicious meatless sandwich by putting sliced ripe avocado, sliced ripe tomato, fresh basil leaves and some crumbled goat cheese or other soft cheese on a slice of toasted whole-grain bread. Avocado makes a tasty addition to sandwiches featuring chicken or turkey breast, either mashed and spread directly on the chosen bread, or added sliced. It may sound unusual to some, but combinations of avocado and fruit can be delectable. Ripe avocado and mango are delicious eaten together as dessert; they can also be fantastic as a salsa with added cilantro, minced hot pepper and lime juice, for example. This salsa can be enjoyed with tortilla chips or used as a condiment for grilled meat, poultry and fish. Avocado is equally delicious paired with watermelon in a simple spinach salad. Chopped avocado also complements sliced, fresh, ripe peaches. Adding nutritious avocado to your diet is not dependent on creative recipes, although many tempting ones are easily researched in cookbooks, magazines, from friends and on the Internet. Putting sliced or diced avocado in salads at dinner and lunch is one of the easier ways to reap its nutritional benefits. Avocado’s mildness lends itself well to inclusion in many favorite salads and makes it unlikely to upstage other ingredients. The healthy fat of avocados can also make it easier to reduce how much salad dressing you use, enhancing nutrition.